My favorite Yogi Tea is back! Mmmm…the Berry Detox blend. It’s good for your liver and your kidneys. (And sometimes I need to think about my liver and my kidneys, because…well…as you know, I overdo things every now and then.) It wasn’t that big a deal when they dropped my flavor – I’m not a huge tea drinker. There are other varieties that’ll do just fine in a pinch, but I’m happy to see it on the shelf again. If you’re unfamiliar with Yogi Tea, every packet has a happy little affirmation printed on the hangy-tag. Some of the sayings don’t say that much to me. Some do. Like this one. “Kindness is the only tool you need.” That’s a very nice sentiment, isn’t it? And it might fly in a place like…I dunno, someplace else. But down here in Texas...? Well, any good Texan’ll tell ya the only tool you really need is a reliable gun…and maybe a pitcher of margaritas. Everybody’s pretty kind down here and I’m pretty sure it’s because everybody knows everybody’s packin’. Except, of course, when they’re in the bar drinking margaritas. Because you can’t bring your gun to the bar. You can bring it to church. You can bring it to the grocery store. But you can’t bring it to the bar. So cheers! And Happy Tuesday! 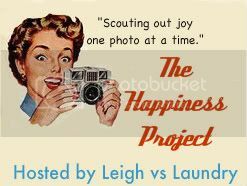 And go join Leigh vs. Laundry’s Happiness Project or I’ll shoot! (just kidding...maybe) Or maybe I’ll pour ya a nice cold margarita on the rocks, because that’s how they’re supposed to be served. (much more likely) And then I’ll brew you some tea to help restore the health of your liver. Because I’m kind like that. Good morning...new follower and happiness participant. 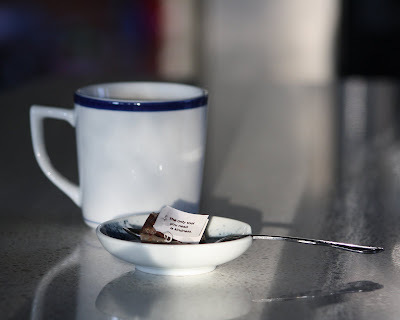 Have a great day...there's nothing like a cup of tea! I love yogi tea too. I'll have to try that flavor. YAY! I love it. All you need is a gun and a margarita on the rocks. And you can take your gun to church but not to the bar! Same justice system here in Georgia! Can I get an amen? I like that phrase about kindness. I think that's going to stick with me! I'm more of a Tazo chai tea kinda girl...but I'm also a tree hugging, yogini wanna be, non-firearm packing gal trying to bring peace and love to the great Lone Star state! OK, that and I've never picked up a gun in my life and I can't shoot straight to save my life. Concealed arms laws are the #1 reason why I never honk at and/or yell at people in traffic here. In Boston it was OK but here it could get me shot! I am more of a coffee drinker than tea, but on some mornings nothing hits the spot better than a cup of tea. That tea sounds SWEET! Get it, it's SWEET? Hahahaha, I slay me! kindness is the only tool you need. some people call me a tool. I'll have to browse the tea section of my mega grocery store and see if they carry this brand. BTW you have two really great blogs.